This box XL has changeable tray divisions. Using the 6 gutters enclosed, you can customise the size of the divisions to your individual requirements. 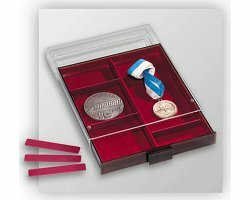 Ideal for storing starter kits, coins in rolls, medals and decorations, or jewellery. Tray colour: smoke; velvet colour: dark red. Internal height: 22 mm. Size (W/L/H): 236 x 303 x 33 mm.